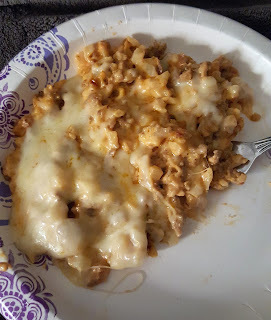 On Keto, I occasionally eat some very strange things. Concoctions I will call them. Things I think up that might pass as a meal. Yes, my meals have gotten very strange and yours will too if you are on Keto, just watch. This would be one of those bizarre meals that somehow works. Cook your sausage in a skillet. Once it is done, drain it (or don't) and add your cauliflower. Stir it together until the cauliflower gets soft. Add your cream cheese and pizza sauce to the skillet and mix together until melted through. Top it with mozzarella and call it good. Now I've never tried making Italian Fried Rice with rice so I don't know how it would be but I can imagine not so bad. Obviously the meal isn't great to look at but was filling and the right mix for my macros today so I'll call it a win.